Clarified Butter Recipe - "GHEE"
it does not burn as easily. Pastries made with clarified butter will retain their freshness longer. 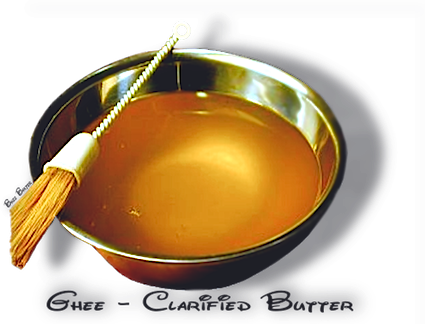 Clarified butter is widely used in East Indian and Middle Eastern cuisines as well. 1. Place 2 lbs butter in a heavy saucepan. Melt over low heat. 2. Skim off foam with a spoon as it rises. 4. Carefully pour off the clear butter into a container, leaving the residue at the bottom. You can make this ahead and have it on hand. Ghee will keep well for weeks in the refrigerator.